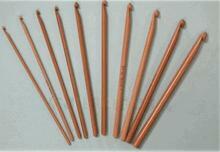 Crochet With Friends Aluminum Crochet Hook in an ergonomic design for easy crocheting. This lightweight hook easily glides through your yarn to make your crochet project a pleasure to make. Crochet With Friends Bamboo Crochet Hook in an ergonomic design for easy crocheting.